I just returned from a weekend in Chicago, where I got to watch a friend get married and (naturally) look at the city through a cyclist's eyes. Due to terrible planning and general clumsiness - the Kitchen Undertaking continues - I didn't bring my Bike Friday to Chicago. But I was even more upset that so many Chicagoans didn't bring bikes either (more on that in a minute). Upon arrival, my wife and I quickly discovered that it isn't the easiest city to see on your own terms. It took two hours to use public transit to get from O'Hare to the Hotel Acme. Though the name may suggest otherwise, they did not provide tools to help catch the Roadrunner. They did, however, have a showcase of snacks wired to an electronic tray: lift the snack, you are charged automatically. It made me think of the opening scene in 'Raiders of the Lost Ark' when he tries to swap a bag of sand for the idol. The room also featured a glassed-in fridge that we couldn't use for our own stuff; just a small, overpriced vending machine was all it was. But it was a fine location and the staff was always friendly. But we didn't stay in the room long, for we set off on foot to see some sights, among which was the Erie St. location of Kozy's Cyclery, which features a mirrored ball on the ceiling (it had been a nightclub years earlier) and a good selection. A worker there directed me to a cycling map of the city. I thought the city was made for cycling since it is quite flat. 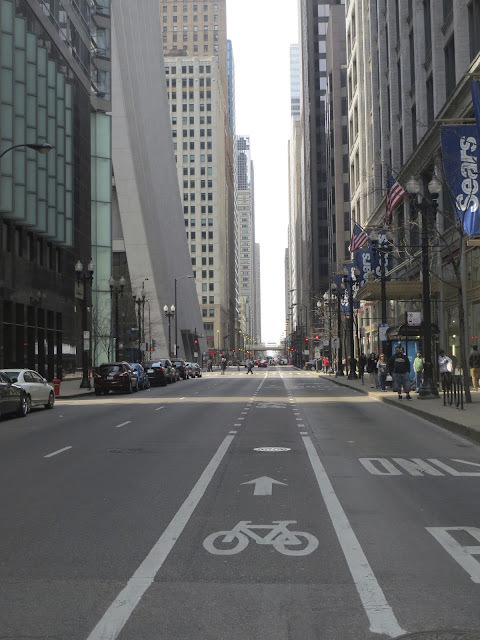 There were some bike lanes about but, like every city, they weren't on every street. It wasn't until we set off in a taxi to Yusho that I became fantastically, remarkably discouraged about Chicago. We caught a cab outside of Hotel Acme. And we hit traffic. It was the kind of traffic where the word 'traffic' isn't enough to describe the glacier-slow procession of automotive cholesterol squirming through urban arteries. I took the first picture on this post while sitting in the cab, mostly because I was tired of watching both the meter and pedestrians move faster than us. What made it particularly ridiculous is every block seemed to feature at least one parking garage that would keep shooting out cars like a Pez dispenser even when there was absolutely no room on the streets for them. Money set aside dyeing the river green on St. Patrick's Day needs to go to bike infrastructure and convincing people who live in the John Hughes-inspired suburbs to ride into the city instead of drive. Rahm, please yell at people until they go to Kozy's or some other local shop and buy a bike. I even found a web site called www.chicagobikeshops.info in case Kozy's isn't convenient enough for them. Seriously, Chicago: I want us to be friends. Now I did befriend Yusho, which was a very nice restaurant that features outstanding food - and the thing that looks like a science experiment on the bar is actually the result of about a year and a half's worth of candle wax. Chicago tried mightily to get on my good side the next day, when we began our day by eating at Eleven, which scored some points for having a Worksman industrial trike chained outside. While walking, I also came upon the Palomar hotel, which had an advertisement out front that made me think that the management of this hotel Gets It. On another taxi ride to the museum circuit we were able to admire the extent cyclists ride along Lake Michigan. I know, it's a lake so it isn't nearly as cool as an ocean - the East Coast Snob within awakens - but it still looks okay. Through the windows of the cab I also could see that Chicago did have a few things that made me realize the bike culture here, while obviously not big enough to influence the people who insist on driving into the city, did have a presence. Our first stop was the Museum of Science and Industry, which has a couple of bike racks out front. We had chosen to visit first based on an exhibit we had learned about on their web site. I was very happy visiting this, particularly a bicycle from the American Star Company, which is notable not just because the design reminds me of my Turner recumbent, but because the bicycle is so similar to the Eagle Bicycle which was made here in Stamford, Connecticut. This style of AMC bike was once pedaled down the steps of the U.S. Capitol to demonstrate its stability in 1885 - too bad the GoPro HD Hero wasn't popular back then. The Art of the Bicycle, which runs through 2018, was worth the admission price alone. But there's so much more to this place: I grew up on day trips from Connecticut to the Boston Museum of Science (and the Astronaut Ice Cream sold in the gift shop) but Chicago's Museum of Science and Industry brings serious competition. It's a Must Go, and the train exhibit, featuring the largest HO scale model railroad I have ever seen, contributes to its Must Go status. The train set is fascinating to look at from a few paces away, but it's also cool to lean as close as you can to take in the details, such as a bear attacking some terrified campers and The Hulk rampaging on a city street. The gift shop is also unusually worthwhile, for in addition to some pretty nice T-shirts promoting the bicycle exhibit they have some reasonably priced American Made owl vomit. I'll leave you to guess which one I left the museum with. Later, we went to The Art Institute of Chicago (the one where Cameron was transfixed by a painting in Ferris Bueller's Day Off) and then to the wedding. And although bikes weren't featured at all it was still a fun occasion I was happy to be a part of. Now that the wedding is over, I really have no reason to go to Chicago again. But if I'm in town again, I will definitely bring a bike, and if you travel to Blues Brothers country at any time, bring a bike yourself. And try to talk some sense into the people who still insist on driving their cars into the city. Thanks for reading and thanks for riding.